Whether you're one of the many international students weighing the relative merits of a handful of fields prior to making your final decision, or if you've already decided to study IT, it is worth noting some of the benefits to study computer science in the US. For any number of reasons—the overwhelming job placement rates of graduates, the high starting salaries, or the variety of applications—the decision to study IT is the third most popular decision for international students seeking degrees in the United States. 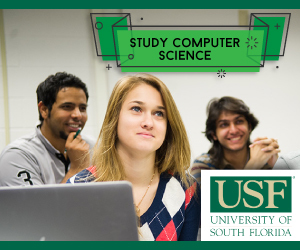 The field of computer science is a vast discipline with many sub-disciplines and applications that span virtually every industry. Generally speaking, computer science is the study of computer technology, both hardware and software. However, that definition doesn't nearly grasp the full range of sub-disciplines (most of which are full-fledged specialized disciplines in and of themselves) encompassed in the field such as: networking, data systems, game development, telecommunications, artificial intelligence, robotics, simulation and modeling, statistics, cryptography, and computational physics and chemistry. This variety of specialization within the field means an undergraduate computer science degree can be attained at most institutions in the US, with more strict specialization taking place at the graduate level. This ensures international students who decide to study computer science in the US will be free to choose from a variety of locations and schools without having to worry about program availability. Moreover, international students looking to study computer science in the US will not just have quantity when it comes to program options, they will have quality. Not only does a computer science degree from a US institution carry weight in its own right, seven of the top 10 computer science schools (according to U.S. News and World Report) are in the US. Also, degrees from computer science programs in the United States hold four of the top 10 positions on the list of ‘Highest Paid Majors Among College Class 2010' released by the National Association of Colleges and Employers. The thorough integration of industry, commerce, and the requirements of everyday life on some application of the field of computer science have given rise to a number of conditions that amount to a windfall for international students deciding to study computer science in the US. For instance, one of the major problems facing today's college graduates is not just finding employment that utilizes their field of study, but finding employment at all. This unfortunate condition most certainly does not afflict those graduating with a computer science degree; many departments boast 89-93% career-track job placement for their graduates, and average job offer rates of 2.3 per student. According to "Occupations with the Most New Jobs: Bachelor's Degrees", (a study released by collegeboard.org, which compiled data from U.S. Department of Labor Bureau of Labor Statistics projections for 2002-2012), six of the 10 occupations with the most new jobs were occupations related to computer science. Not only do those who study IT have the security of employment awaiting them, chances are that the student will have the luxury of choosing the career that fits them and their passions best due to the ubiquitous application of computer science across industries. Whether an application in entertainment, engineering, government, medicine, communications, education, defense, or business and commerce, the world turns on technology and those with computer science degrees will have their pick of how to utilize their in-demand skills in a lucrative career of their choosing.